This post is dedicated to the memory of our son, Preston, who loved music. And life. Several months ago, I watched the Glee episode honoring actor, Corey Monteith through his character, Finn Hudson. Yes, I’m a gleek. I happen to enjoy listening to immensely talented people sing from a place of authentic talent without an electronically mixed “voice enhancer thingamajig.” I of course fell to pieces, as did many. The episode was rich with raw emotion, unfiltered for the camera. It was clear that at times you weren’t watching actors act. But rather human beings who knew Corey, in devastating pain over the loss of a dear friend, as they cried uncontrollably while listening to another cast member sing their tribute song. It was even sadder still that Corey’s kind and giving spirit couldn’t overcome his demons. It was a tangible example that life doesn’t always give us happy endings. But we go on. Trying the best to make the sweet out of life’s bitter. Emphasizing for us again, that the sad place we are in isn’t an ending, but rather a new place to begin from. Encouraging us to measure a life, “our life” before our seasons run out. As each of them sang their way to the threshold of healing, I was reminded how music mends our broken hearts. Song lyrics set to music make us feel as if we belong to a community of like emotions. It has the power to take us to another place and time for a few life enforcing minutes. If we only allow it. Music makes us cry when we’re trying hard not to. It makes us dance when we’re happy or feel the need to release pent-up stress. You know, the infamous, when no one is watching dance. Our body and soul become lost in a wonderful free spirit place the music takes us to. Each song the various characters sang, was the chosen music of acceptance for Finn’s friends as they each celebrated the life of a friend. It reminded me of a dark place I was once in, as I watched Finn’s mom kneeling on the floor in his bedroom crying out loud as she asked, “How do parents go on when they lose a child? How do they wake up everyday? How do they breath?” It briefly transported me to visit with a similar pain. One I haven’t called on in awhile. It loudly turned up a melody that usually plays softly in the background of my life. As my mind traveled back in time, I remembered a very special gift that was presented to me by my best friend when our son died. She made a “death CD” for me. I know it sounds morbid. In reality, it was one of the gentlest, most loving gifts I’ve ever received. My friend knew that I would resist going into a very dark and deep place for too long. The CD was comprised of songs about death and moving on, as well as a few Celtic songs for my Irish heart. She knew how very much I would need to be led by the music. She also knew that I would play the CD over and over when I was alone and get lost in the lyrics and melody: completely and unabashedly letting go. That I would become absorbed in the gut wrenching pain of grief. And when the CD was over I would stand up and begin again. So I began to heal – over and over, as the music of acceptance took my hand: like a lighthouse guiding a ship to safe harbor. It led me to my safe place. One where I could grieve and mend my broken heart, free of judgement or guilt. Music helped me take on the hardest work I’ve ever known. The restoration of my heart and soul. Defining the undefinable. And to make whole again, the shattered notes of my life. Music allows our very soul to be a time traveler as we leave one realm in search of another. It helps us to realize that no matter how far we go, eventually we come back to our center. Knowing there’s no place like home…our purest heart. Letting music take us to another place in time helps us to better appreciate where we are now. When I worked in special education advocacy I sometimes started my presentation by saying, “Our family has traveled a long journey to get to this place and time. Before I tell you the particulars of the here and now, allow me to first share with you where we’ve been, so you can better appreciate why I stand before you today.” I often played a video about inclusion accompanied by the background music of Louis Armstrong singing, “What a Wonderful World.” My hope was that his beautiful song would transport the audience from a place of judgment to objectiveness. That it would temporarily allow each and every person to step out of their guarded boxes and preheat their hearts to a temperature of possibility – warmed up and ready to receive my words. Music sings to us a certain season of life. Ringing true in our heart of hearts. Our son died seven years ago, just five days before Christmas. Songs of the season that once elevated my heart with love and joy initially scratched harshly at it, like a needle skipping recklessly over a record. Leaving indelible marks in the tracks of my heart forever, I feared. For the soul cannot sing without the vibration of its heart. Today my heart tenderly acknowledges the permanent indentations that carry with them the soundtrack of his life. I play it back: returning to my safe harbor, celebrating a love-filled life that touched the hearts of many. For those who are grieving – I am sorry. Truly sorry. Whether you are grieving over the death of a loved one, the end of a relationship, or a newly empty nest. However your life has taken a turn for the unexpected. Tune in to the music of acceptance in your life. Let it take you down if down is where you need to start. I’ve learned many things through my life experiences. I know that down isn’t a bad place. But rather a forgiving place of reality. It allows you to excavate your soul to a state of raw beauty. It permits you to see what others have missed. To examine your life closely in a new light. Unearthing the untruths. And like a virtual life net, allowing only the truths to emerge to the surface. Providing the realization that in order to heal you eventually you have to look up. As you begin to live a life again, with your new music of choice. Music expands our lungs with a breath of hope. Whatever your music. Dance boldly in its uplifting crescendo. Or sit quietly amongst its melodious healing tone. Cry with it, laugh with it. Let the ebb and flow of its rhythm reach every bump, wrinkle and wonder of your life story. The music of acceptance loves us in the most unconditional of ways. Enlivening our senses and setting us free. Music releases our inner voices, shouting out loudly…our pain and our joy. Music reckons our soul to a place of acceptance. A genuine place where we can begin anew. This year our ears will receive the music of acceptance. Songs that were once too shrill to hear, now reinforce in our hearts the spirit of the season. Today we’ll reflect on the wonderment of Preston’s life and the joy of Christmas he so dearly loved. A gentle soul who always had a song in his heart. We’ll remember what joy music brought to Preston. What joy he brought to us. And with every Christmas song I hear, I will sing him back to me. I am a writer, thinker, life-long learner, and philosopher of all things, who also happens to be Irish, sarcastic and very intuitive. I'm an 'every-aged' woman who never plans on growing up, just evolving as I go. Passion is my guiding force. My husband and I are enjoying life immensely in our Not So Empty Nest and beyond, by celebrating each and every day as it comes to us. 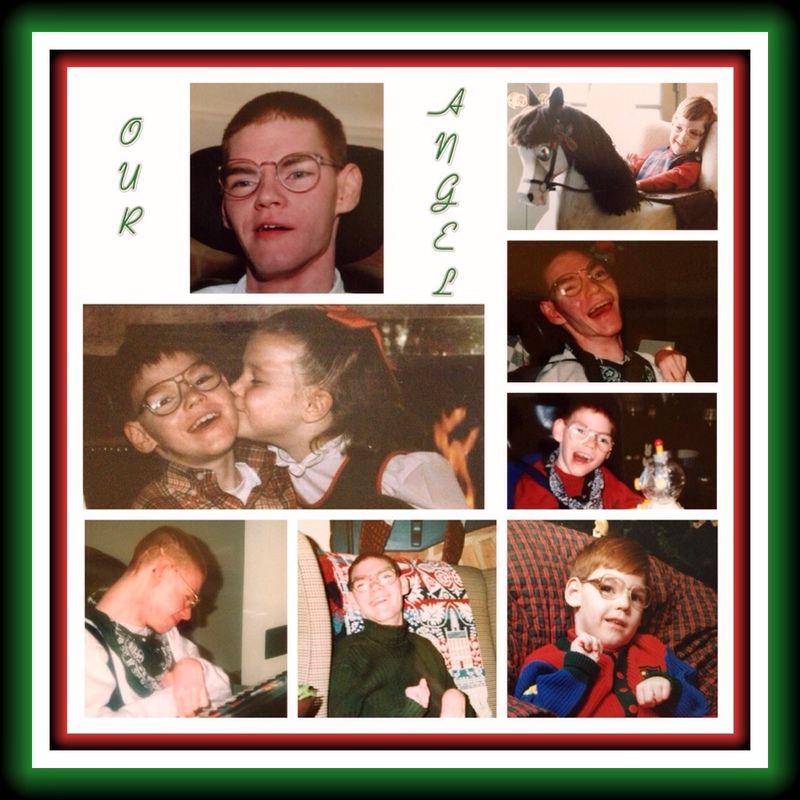 This entry was posted in Christmas, Courage, Disabilities, Loss of a Child and tagged acceptance, Christmas, courage, death, disabilities, Empty nest, healing, inclusion, Inspiration, joy, loss of a child, Love, music, NESTpirations, special needs. Bookmark the permalink. A beautiful post Drapers – bless Preston and the love of music. Thank you, Charlotte! He was quite an inspirational force in our lives. Best of luck with your upcoming nuptials!